Been so long since i last posted! Been so busy since then... preparing for exams and all. Tmr will be the start of my final exams, final lap! I pray that i will do well to secure my honors... pray that the paper tmr will not be stunning ! My paper at 10am at Expo Hall 7. Pray for me if u are reading this post... Tues will be my 2nd paper too... Once tmr starts, everything gonna be moving along fast as time pass fast too... After exams im looking forward to my Tioman trip with the gals!! 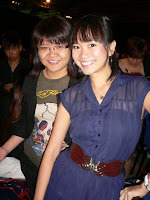 Im here to revive my blog after so long! have been real busy! Prelims just over and hopefully can do well though. Just ended Prudential Success Academy Foundation 1 also. Will be working as a FC in May. Anyone needs financial planning can refer to me. April will be super packed for me as i have revision classes in school. Some days will be staying in school until 10pm. Gosh, i need strength. Have been very tired these days and that day was very sick until almost blackout. Cant even teach tuition properly. Have to sit down to write on the board. Tmr will be going to work in the morning and then at night having CG. So fast March will be over soon. 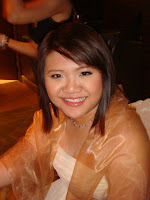 Oh ya sunday attending Kristl's Wedding at Fullerton Hotel. So happy for this sister of mine. Last time used to be in the same CG. Yeah! Went to Focus Group today about technology and handphones at Duxton hill and the place was so difficult to find. Nevertheless, it was great and i made $80 within 2 hrs! Just changed my spectacles frame today too. CNY, wanna have it new. haha! Anyway the old one is rather cannot make it already. Today is a busy day for me. After school headed to ICA to meet the foreign students cause they need to extend their VISA and ICA Officer needs to see school rep. This is for my job at SAA. Waited for so long there and ended everything around 2 plus. Then i went to the MRT station and tapped in and then my colleague called and ask me go back ICA cause another student otw from school. Wasted my money cause i just tapped in. I went to have my lunch and then after that say dont need wait already. go back to office so i went back. At 5pm the student called again and i got to go back ICA. Oh man! A day of travelling to the same place. After that i headed home and then my mum came home at 7pm and shout. just cause of dinner, whether to buy or cook. 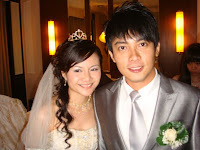 want my dad to buy back then she hiam so much. say downstairs food not nice. wat the hell... dont eat better la, like that also want to find fault. Prelims exam dates are out and i got to really start mugging now! Time is flying! Had a long day at work today but was really waiting for the time to pass. 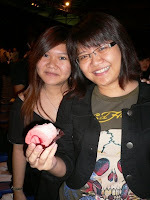 Met up with Bestie Ada and Kaishing for dinner at Far East Plaza and then walked around. Headed home for conference call at 10pm. 2 weeks time, my CG will combine with another CG and multiply. I know it is for the good of all of us, so that we will really experience revival, have new mix of members and have new things, step out of our comfort zone, new creativity and new ways of doing things and not just having a routine set of things to do. Im excited for all these things. On the other hand, definitely will still be saddened cause of the relationships we had in the CG. Anyway N283, no matter what, im always here for all of you and u can still call me anytime. I love all of you and sorry if i have not been a good member to u all these while. Lets keep in touch and lets all grow this year. Let 2010 be the best year yet. This is the period of transition and testing and i believe if God brings us into this, He will see us through. Let us be strong like a catus. You may feel reality catching up with you now that karmic Saturn is squaring your key planet Pluto. You know that change is possible, even necessary, but it could seem too overwhelming today to do anything about it at all. If it feels like you have bitten off more than you can chew, declare a temporary moratorium to give yourself some downtime. You'll have a better chance to meet your deadlines if you take a break to replenish your energy. This is so true now i think? Got to redo my blogskins again and hopefully my desktop or my cousin had a backup copy of my links etc cause now all gone...anyway, just received an announcement on Friday about my CG that we all combine with another CG and multiply out. The dreaded news has finally hit us this year and well, we got to accept it and face the changes that is about to come. There's good and bad about it and it hurts. Think all of us will be affected emotionally in a way or another. We have been together for years and our relationship has been so closed. Sometimes, when we are no longer in the CG, somehow no matter how close u used to be, when u leave, the closeness is no longer the same. I have experienced this so many times and it really saddens me. Although we may still talk but it's really hard to meet up. At least if u are in same CG, we do meet up twice a week. Well, nothing can be done now but to face this fact. Just hope that things will be fine for us even when we are no longer together. Hopefully i would be fine too... Im really stresed recently with lotsa stuffs such as Studies and all. When hit with this announcement, it is another thing that bothers me. Everyday i really burdened with this now and my heart really hurts... I may appear alright but deep inside me, im not alright. First Wedding in the Family! 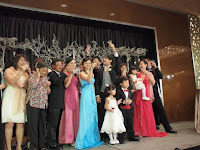 Wed was my sister's wedding! It was simply awesome and splendid! We woke up very early at around 6 plus and prepared for the day. The make up artist came shortly. My bro in law came later on and we had the gatecrashing ceremony. It was very fun as we have to sabo him and let him eat all the different stuffs such as fish which he detested the most, bittergourd, celery, lemon, cuttlefish with lotsa wasabi and chilli in it. 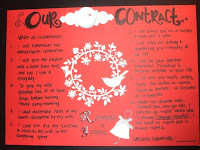 The contract that my sis made was so funny. haha! 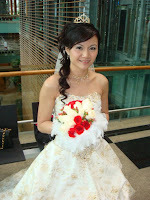 Then they went off to my bro in law house and also to Changi Airport for photoshoot. In the afternoon we had tea ceremony and i got to serve tea to them as well. The night was really awesome as all of us are dressed up and it seems like a make over especially for me! hahaha! looks really so different! It's a new beginning for 2010! The dinner was still alright and i was seated at the VIP table. The night ended and then we went back to the hotel. All of us were really deadbeat. Slept around 1 plus and the next day had to go to work. Was really tired. I even asked for off from my Aljunied job cause i really could not take it. I simply needed the rest. Alright, shall post up some pics for you all to view. I shall go and do my assignment now. You may be stressing about the work you see for yourself in the coming weeks. You might feel extra pressure as your two key planets, Mars and Pluto, engage in an anxious aspect today. The message from these tough planets now is "no pain, no gain." It's like working out; the more you put into it, the more you get out of it. Just remember not to succumb to self-doubt, for the emotional intensity will lessen over the days ahead. Got this from Twitter. sounds true? haha.. Anyway rested at home the whole of today. been so long since i ever stayed at home the whole day. Tmr will be back to work. played the guitar,worship and prayed just now. Leave 2010 to God and pray for a better year ahead. Im so tired and down this whole week. Emotions are all mixed up! Tired and moody and gets pissed off. Certain things are just beyond control and well, it really doesnt seems like a new year. Of course i would hope that 2010 will be a better year as i will be graduating and going to another phase of life. I just hope for better things to come. In certain areas,there would be more challenges faced and i hope i can go thru all of them well. Started the year bad cause im kind of broke now. Im tired but i just need to work to earn. i just want a day to rest at home or so. im deadbeat. Some things are back on a cycle and oh man, i hate these feelings! It's just such a bother to me! I need to chill but money is needed so best is stay at home and rest. 1st post of the year but it has to sound so down and stuff. Well, i did not want it to be this way but what to do. It already had been this way. Hope next week would be better. No appetite to eat and dun feel like talking that much anymore. Hey all! Merry Christmas!! It had been hectic for me juggling between school and work. This long weekend is also very busy. 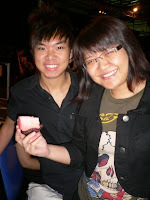 Yesterday had BBQ at uncle's house and then head down to Orchard Road with my cousins together with my uncle and aunt! 7 of us had total of more than 100 spray cans and it was so far! We were having "war" there and getting very dirty too! This year was the dirtiest as many people attacked us with the sprays. haha! had a hard time bathing and cleaning it off.lol! This morning went to church for xmas service. Drama was awesome, funny and touching! Thank God that He sent Jesus to die for us. Tmr would be meeting my sec school friends for xmas celebration and gift exchange. Im kinda broke already so hopefully wont spend so much tmr if not i need to eat grass le next week. lol! Sunday will be going service in the morning and then evening having appreciation CG and gift exchange! Pray for strength for the rest of this week! Turn shopping for ecofriendly housebrands into profitable business from home! Since 1985, more and more consumers from North America to Asia, including Singapore, have discovered the secret of Getting Paid for Life through learning from us how to be smarter consumers. Find out how the internet can help turn your family's switching to safer, more economical & environmentally-responsible house brands into a Profitable Work-from-Home Extra Income Opportunity! Moreover, since March 2006, thousands of families in Singapore, (most of whom have thought it was too good to be true then) are now consistently earning a reliable monthly income by learning how to be smarter shoppers than the rest of the population. So why pay to shop when you can GET PAID FOR LIFE for shopping smarter! No hypes, no gimmicks – real consumers switching to safer, more economical and environmentally-responsible consumer products that they really need each and every month. It provides your family an unique avenue to earn REAL INCOME every single month, year after year long after you have retired from your full-time job or other tiring businesses! Alright! Here are some photos so that my blog wont be so wordy! haha! will post more soon! 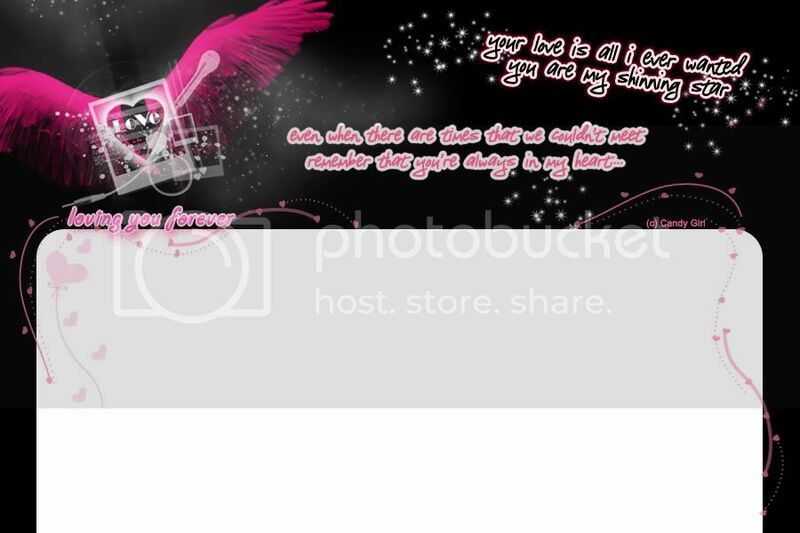 Im here to revive my blog. Been very busy as usual. 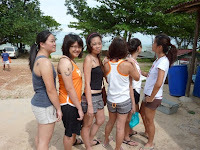 Last weekend went to Desaru with my sisters aka my secondary school besties. It's our first trip overseas together and more to come. Really had great fun chatting and all sorts of things. We always chat about our Sec Sch life when we gather.haha. Really fun. Those memories, those days. Had seafood there and also had lobsters. Then we have different drivers taking turn to drive too.haha. Thank God everything went well too. The weather was alright but the sea waves was really dangerous this time round cause i think it is the rainy season so thats why this time, it is high tide. The gals went Jet Ski and Kayaking and 2 of my friends got injured while Kayaking cause of the waves.We also went to Ostrich Farm which i went before last year when i was at Desaru. Next gathering with them would be Xmas. Will post some desaru pics soon when i am free. Pardon me for the wordy blog.haha..
Hey all! how are all of you doing? well, i had a hectic week as usual. Mon and Tues had M5 tutorial from 9am to 4pm. Monday after M5, went to Timbre with Ada and Kaishing. Had a great time of fellowship and we even dedicate songs for the band to play and Ada and Kaishing were drawing on the serviettes. haha! Then, the singer asked are we from fine arts. LOL!! Had been raining almost everyday. I just hope the raining season ends soon. Be going Desaru soon so please dont rain! Tues had food tasting for my sis wedding at Pine Court. The food is nice and nice place to be at. The rest of the week i was busy working as usual at SAA and Prudential as well. Just taken my M5 exam yesterday and i passed!! Next up will be M9 exam in Dec. I shall just try out this career opportunity that is given to me and see how it will go since it is related to my field of studies in Poly and University. Yesterday had Cell Group and man, i kana forfeit from game and then guess what is my forfeit? i got to dress up wearing skirts, dress or leggings until the end of year when i attend service! Gosh! This is a brand new kind of forfeit created and theres even contract written and signed! LOL! My cell group is really hilarious and they got really excited when doing this to me. Poor me, now i got to scratched my head and think every week what to wear etc and how.haha! My word is my bond so what to do? hmm... cause the other choices they gave me were to dance! For goodness sake, i cant dance for nuts! Spoil my image and reputation. haha! Just be a laughing stock and crack up everyone's day. Thats what i always do!! LOL! just do silly things to make people happy. After cell group, i head down to St James to meet my Maybank colleagues. Didnt really do much there though and left around 1 plus. Thanks Ada, Kaishing, Weiyi and Dennis for surprising me at my house today! Ada actually bluff me during the week that she will be coming alone but thats actually in the plan to make me sian and then later on will be surprised. I am very surprise with the big board for my card! Ada is really very creative! Thanks for that! 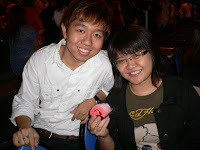 Its at your expense somemore and thanks Weiyi for the cake too! Appreciate all your efforts and Kaishing to travel so far as well. Im really touched and feel loved to have friends like you all. I believe the rest couldnt come cause they have their reasons ba. My bday will be over in just 5 mins...At least i think i ended the day well. We went to Ajisen at Seng Kang for dinner, had ramen. And then after that went to Starbucks to chill and have a drink. Although it is just that 2 hrs or so, it really mean a lot to me. At least i feel important to you all. Yesterday went to chalet after church to celebrate my cousin Shaun's 12th bday at aloha loyang. My aunts also bought a Oreo Cheesecake for me! Thanks a lot! So sweet of them! It is my 1st whole full cake this year. Cell group also sang bday song to me after church. At midnight, went to the chalet room and my cousins sang very loudly to me! Thanks a lot! This year i really dunno what to expect and dun really expect much somehow on my actual day. Got not much mood like that. To me, bday is really important as it shows how important you are to others and your significance. So i always wish that my bday will be great and stuffs like that but sometimes sadly, it is not so. I shall just wait for the day to end. Half the day is already gone just like that...Going to get my lunch and then start doing my assignment. Feel like God is telling me, my precious child, I remember your birthday and you are created by me on this day. Started my new job at SAA today. It was still alright. I thank God for the strength because i dont really feel tired at all today although it was a long day and it was quite busy at work. Lotsa stuffs for me to do and i worked until 730pm today cause got to give out notes to ACCA students. Tmr got to go ICA to drop documents before going to work after school. Tmr got to wake up at 6am and will end my work at 6pm ba...There's a lot of bday treats email that i received. haha! I received one from NTUC Income and i wonder why. lol! Counting down to my bday! exactly 1 week! Woo! 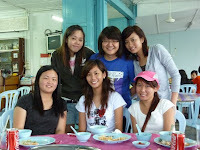 My sec sch friends have already celebrated for me 2 weeks ago together with my friend. So this year my bday on the actual day i got no idea what to do and it's on a Sunday. guess i will be rotting at home. haha. 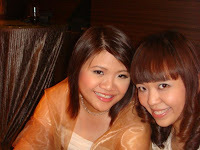 Saturday would be going to chalet for my cousin bday celebration as well. His 12th bday on 10 Nov. I am very stressed financially and all. My stress is from all areas of life. From Family, church, school and finance. At times it really overwhelms me and i couldnt take it anymore. Sometimes it is worse when people come and irritates me further or dont understand me at all. I really dunno what to do and i do get frustrated. I dont wanna to be taken for granted and what if one day when i am gone, what will happen? Sometimes people dont really treasure until the person is gone then you come and regret. I am really trying to find a job now. Sent a lot of resumes for whatever kind of job. I got no choice but to work so hard if not i really cant meet the ends meet. Theres too much for me to take in my strides and im just doing that. I really hope people can understand me at times and not accuse me. I really hate it when people accuse me for something i did not do. I do have my limits and patience. Dont think i wont get angry and always smile to you. I will show you my wrath one day if i cant take it! Yesterday CG and today service was great. It's the message for the season. Indeed we got to be true worshippers and stand still and wait on God when things happen and not make ourselves our own God. It reminds me of the song Still. The lyrics goes Hide me down, under your wings, cover me within your mighty hands. When the oceans rise and thunders roar, I will soar with you above the storms. Father you are King over the flood, I will be still and know You're God. Indeed got to keep on trusting in God and be still. Today pastor preach about the 7 kinds of suffering we will encounter in our life. It's really true and I really been through a lot of sufferings and until now i still have them. Really got to be strong and keep on keeping on. Got to have the faith and keep trusting in God no matter what situation it is. Got to stop questioning about why things happen and just accept life itself. We got to be the one to make life a spring. No one can help us except us ourselves. We are the one controlling our own mind and the mind is really a powerful tool. If our mindset is wrong, we will see things from a different view. Pastor also said that Power is in self encouraging. Sometimes when things happen, people might not be around us to cheer us on but we got to really keep encouraging ourselves, never to give up! Just now i also thinking of the childrens' church song titled Never Give up! God is always there for us. Even if we do not see his hand, got to keep on trusting His heart. Everything happens for a reason and we will just need to keep waiting upon it and see whats next. 3 more weeks to my birthday! Woo! Time flies! haha! here's my wishlist! Will you find out who you are, too late to change? Hey my dear readers! How are you doing? Sorry for not updating for such a long time. Been busy since school started and very very tired lately. Time flies when school starts. Got 2 assignments on hand to do now. Some of my tuitions have stopped cause exams is over for my students. There's good and bad point. Good is i can rest but the bad part is i got no income. Need to find some ways to get extra income now. Going out soon for my last lesson with my student cause tmr is N level POA then going to my cousin house later. Dunno what to update although havent been updating. Every week is just a routine, doing the same things over and over again. 1 more month to my birthday and i got no idea what i will be doing. School has officially started yesterday! Time to study hard once again. It's my final year and im aiming for my 2nd upper honors degree! Hope that this year modules will be manageable. Well, ytd went to class alone and it was really very boring. Tempt me to crash my friend's class le. haha! Tmr will be the 2nd day of school and my day will begin at 830am. Argh! Very long never wake up that early for school le. Tmr will be a big challenge. Im so tired lately still. I think i need to try to sleep earlier once again already. School has started and I need to adjust back my body clock. No more very late nights! Anyway ytd I also changed my internet to Singnet already! It's so much faster of course and im so happy that i made that decision to change. Will be getting free netbook soon also. Yeah! Now i can watch show without the need to keep pause and wait for it to load. It's so much faster and smooth now. Since I came back from Korea, had been very tired everyday and very busy. Soon my school will be starting and I will be in my final year. Aiming for my 2nd upper class honors! Pray that this school term everything will be fine and i will be consistent in my revision. Registered for my modules last Saturday and it took me about 2 hours to do so. The server was lagging like mad and lotsa errors. I will be having classes on Tues 830am, Wed 330pm and Friday 830am to 330pm. Friday will be a busy day cause after that i will have CG at night and this means i would need to rush here and there. Have to rush home to get my guitar and practise it for CG too. Pray for strength! On the 2nd week of school i will have make up lessons already from 7pm to 10pm! Gosh! Hello my dear readers! Im back from Korea! 6 Days Korea Wonderland trip was really awesome and fun-filled. The weather there is just nice. Although in the noon the sun is out but then it is not as hot as singapore. The wind is still cooling there and dont really perspire compared to the weather here in Singapore. So here's what we did during the trip! Friday went to the airport at around 8 plus, check in and took the plane at 10 plus at night. Reached Korea at around 5 plus singapore time. The time in Korea is 1 hour faster than in Singapore. After eating our own breakfast there, we set off officially with the tour. First we went to Nami Island where the drama Winter Sonata was being filmed there. It is a nice island with lots of trees and stuffs. Nature is simply very awesome. After that we also went to have our lunch and went to Chuncheon Myong Dong to shop. Then we return back to our hotel and proceed for dinner and free time at night. Everyday we woke up at 6am Singapore time. It's really madness. haha. Our meals always consist of kim chi and lotsa side dishes and most of them are veg. The second say we went to Herb Land and i even saw this Bible garden there. LOL! The flowers there are really very nice and my mum was so amazed and excited once she sees them. Same goes to my grandma. We also went to Yeoju Premium Outlets where all the branded stuffs are there. Didnt really buy anything there. Only bought 1 pair of Vans shoe there. We also went to Fruit farm to pick fruits. Each one of us is allowed to pick one big pear. At the Korea Traditional Cultural Centre we learnt how to make Kimchi and also have the chance to wear hanbok to take photos. The photos will be uploaded soon i guess. Have to wait for my sis to do that cause it's really a lot. Had a fun filled day at Everland where we went to the Safari zoo and saw Lions, Tiger, Bears that perform their tricks and even Liger which is due to a Lion and Tiger being mate together. There's lotsa things to take about but i guess pictures would tell better. haha! If not my blog post would be super duper long. That night we also went to Dongdaemum market which is a night market and have a few shopping centres there and one can shop until around 6am in the morning. Isn't it cool? Alright just a quick summary of the last 2 days. We went to Gyeongbok Palace which is built in 1304 during the Chosun Dynasty. Nothing much there though cause it's about history and im not so interested about it. We also went to take a look at the Presidential Blue House but of course we cant enter. We only take a look outside. Also did DIY mini facial and then headed to the Face Shop. Products there are really very cheap. Singapore price is 3 times theirs. Gosh! On the last day while heading to the airport, we took the Seagull Boat Ride and have opportunities to feed the seagull and admire the beautiful sceneries. It is really an eye opening experience and i really enjoyed this trip. Will of course dont feel like coming back to Singapore so soon also. haha! Went out with Ada, Kaishing and Dennis today to eat Lai Lai beef noodle. Walked around Bugis after that too. Enjoyed my day with them but however when i reached home, my mood changed. Was super angry because my mum anyhow take my clothes and want to donate to people! Without my permission and some of the clothes are still brand new and it's Levis and Espirit shirt. The Espirit is my cell group gave me for my bday last year! Gosh! My mum always likes to touch people's things without permission and anyhow throw! Super Angry! No wonder last time my clothes also always lost. I really hate it lo! What if my clothes are very very ex and she just anyhow throw! I really cant tolerate this at all! Never respect me at all and anyhow throw. She even take my clothes and put in her cupboard and how to expect me to wear when i dunno! Really blow my top at her! I got no tolerance and patience to this! When im angry, you will get it. Really super irritating! Hey readers! Long time didnt update my blog. haha. dunno what to update. Life is still the same afterall. Still busy with the same stuffs. Anyway, yesterday went to watch Final Destination 4 with some of my friends. I think compared to Final Destination 3 it is not as good though. Yesterday also went to have sushi buffet at Hougang Plaza. It is rather cheap and can eat lotsa stuff. Can keep eating Salmon sashimi and there is no cap on it. How cool. haha. On Thurs, I happen to see my exam results on the SIM system but then by right, we should not see it on that day. I think there is some loophole. Some people still cant see the results. We got to wait until Tues to confirm again the results I think. But i saw my results and i manage to pass all my 4 modules. Thank God for it. Next year got to work harder to aim for my 2nd upper honors degree. I am looking forward to this week cause I will be going to Korea with my family. Will be able to get out of Singapore for a breather. Getting kinda stress with certain things already. Pressure is on me. It's the right time to get away. Really pray for God's grace and strength. Pray that people will be cooperative, united as one. If not, it will really be tough. Pray that everyone will be after God's heart 100%. No more excuses or anything else. I am interceeding and I really hope God will help me through. Didn't manage to fly kite today due to the bad weather. This is the rainy season once again. The weather really make me dread going out today. It's like dragging my feet out and i was still rather tired. Basically went out around 4 plus to Seng Kang and then slack around there with my cell members. Later on after eating some small bites at Swensens, we went off to Chomp Chomp to eat. Was very crowded there but we manage to get seats after some time. Ordered different food to share as usual. Left at 9 plus but since Guo Xiong still had some time before booking in, 4 of us who are the remaining people went to Ice Cube to chill. It is quite a nice place to chill. haha. There's lotsa desserts there, waffles and crepes. Just reached home a while ago. Tmr will be home the whole day until evening. Ada might be coming over after school. Basically today overall the day was still ok but also quite sian though. Yesterday was rather tired. Woke up at 12 plus but still very tired. had lotsa crazy weird dreams. Omg man! Really crazy dreams. Wonder why too. Had CG yesterday and the songs i played were rather challenging and didn't really play well but God is good. His presence is still there. Was really tired and rather no mood yesterday. This past week was rather busy and tiring. Travelling cost is really on the high. Need to keep topping up the EZ link card. Today had service and it was great. I breakthrough today cause i wore skirt and it's like makeover. LOL! I just need more self assurance and more confidence. Took me courage to step out of my comfort zone man. Tmr will be going to fly kite with my CG at Seng Kang. Wonder did i ever fly kite before in my 22 years of life? haha! This is interesting. Im so exhausted! This morning went to work. Boss came in late so i was just stoning there most of the time, reading book and surfing internet. Just had my lunch an hour ago and so here i am blogging. So fast it's the middle of the week already. Waiting for my tuitions to hit 4th lesson so that i could get my pay. Rather broke already. Exam results will be out in 2 weeks time. Korea in 3 weeks time and Operation in a month's time. 1 more month and school will start once again too! Time flies! Nothing much to do now. Feel like going to rest soon. Very tired. Currently still finding more tuition so that to earn more and also i joined this work at home business. Interested can ask me about it. Quite interesting. I hesitate but answer it anyway.